You are given a string containing characters and only. Your task is to change it into a string such that there are no matching adjacent characters. To do this, you are allowed to delete zero or more characters in the string. For example, given the string , remove an at positions and to make in deletions. Complete the alternatingCharacters function in the editor below. 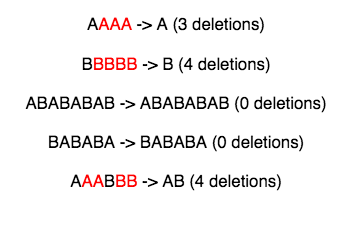 It must return an integer representing the minimum number of deletions to make the alternating string. The next lines each contain a string . For each query, print the minimum number of deletions required on a new line. The characters marked red are the ones that can be deleted so that the string doesn't have matching consecutive characters.